Enhanced reproductive output after sublethal insecticide exposure, including neonicotinoid exposure, has been reported in a diversity of arthropods. Suspicions of such a phenomenon in the Neotropical brown stink bug, Euschistus heros (Hemiptera: Pentatomidae), were sparked by the increasing densities of naturally occurring populations of this insect pest species in Brazilian soybean fields. Here, we tested whether the sublethal exposure to imidacloprid would induce changes in the survival and reproductive performances of E. heros adult females. The imidacloprid estimated LC50 was 0.83 (0.60–1.25) μg a.i./cm2, and the dose recommended for field applications (4.2 μg a.i./cm2) was within the concentration range of the imidacloprid estimated LC80 [2.66 (1.65–5.49) μg a.i./cm2]. Newly emerged (≤24 h) adult females were exposed for 48 h to dry imidacloprid residues (0.042 μg/cm2, equivalent to 1 % of the field rate dose) and exhibited higher levels of cell damage, greater ovariole length, and a larger area of the most developed follicle in their ovaries up to the 6th day of adulthood. Furthermore, these females exhibited reduced rates of survival but higher fecundity and fertility rates compared with untreated females. Our results thus suggest that females of E. heros increased their reproductive output in response to the imidacloprid sublethal exposure. 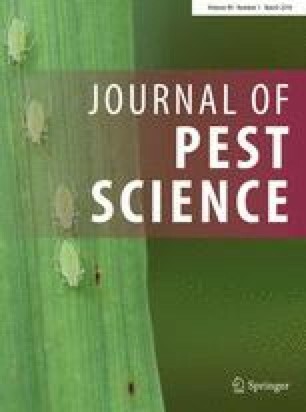 These findings suggest a potential involvement of sublethal exposure to neonicotinoids in the recent outbreaks of the Neotropical brown stink bug E. heros observed in Brazilian soybean-producing regions. This work was supported by grants from CAPES Foundation, the National Council of Scientific and Technological Development (CNPq), the Minas Gerais State Foundation for Research Aid (FAPEMIG), and the Arthur Bernardes Foundation (FUNARBE). We thank Daniela C. Guedes and Nathaly N. C. Miranda for their excellent technical assistance.